The head of the agency that some Democrats want to abolish also denounced political vitriol. WASHINGTON — The acting head of U.S. Immigration and Customs Enforcement told senators Thursday that employees' morale has suffered because of the bitter political climate, and he apologized for sending a tweet in 2015 that suggested renaming the Democratic Party as the "NeoKlanist" party. 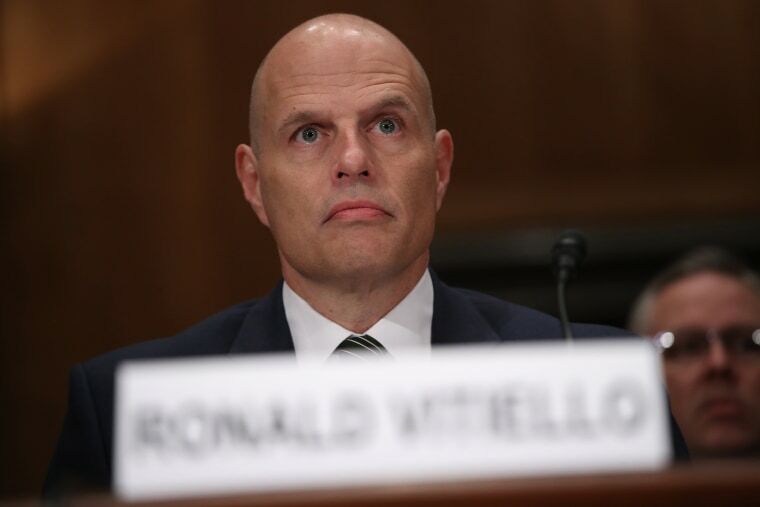 The Senate Homeland Security and Governmental Affairs Committee heard testimony on whether to confirm Ronald Vitiello as head of an agency that some Democrats want to abolish. Vitiello said ICE employees are threatened with violence or targeted at their homes. "They should not have to bear the burden of attacks motivated largely by political and policy disagreements," he said. But Vitiello was questioned by Sen. Gary Peters, D-Mich., about a tweet Vitiello sent from a personal account in 2015. It was in reply to a message to conservative talk show host Mark Levin asking for new names for the Democratic party. Vitiello responded: "liberalcratic party or the NeoKlanist party." He told senators it was wrong to send it, though he added he thought he was sending a direct message, not a public tweet. "It's important and I understand the gravity, it was meant as a joke I wasn't trying to do anything other than make a joke. I regret it," he said. Vitiello has been a law enforcement agent for more than 30 years, starting in 1985 with the U.S. Border Patrol. He was previously Border Patrol chief and deputy commissioner U.S. Customs and Border Protection, which oversees the patrol. Letters of support from police, lawmakers and career law enforcement officers spoke of Vitiello's professionalism and dedication, including one from Gil Kerlikowske, the former commissioner of U.S. Customs and Border Protection under President Barack Obama. Part of ICE's mission is to make arrests of immigrants in the U.S. illegally, which has made it a symbol of President Donald Trump's hardline policies. Trump did away with an Obama-era policy prioritizing dangerous criminals for removal. ICE officials say they still have the same priorities — arrests of migrants with a criminal history rose 50 percent during the 2018 budget year, and some 900,000 pounds of narcotics were seized. Vitiello said the agency arrested 11,000 known or suspected gang members and removed 6,000 from the country. Sen. Kamala Harris, D-Calif., who has said the government "maybe" should "start from scratch" on an immigration enforcement agency, questioned Vitiello on the perception of ICE that it uses arrests to cause fear and intimidation among immigrants, particularly those from Mexico and Central America. Harris has stopped short of saying ICE should be abolished. Vitiello said the agency is enforcing the law and officers do the best they can. Sen. Doug Jones, D-Ala., asked whether Vitiello would help tone down harsh words coming out of the White House on immigration and immigrants. He invoked the 1963 church bombing in Birmingham, Alabama, that killed four black girls. The deadly act was a direct result of racist inflammatory words by Alabama lawmakers and law enforcement, said Jones, who as a federal attorney, prosecuted in the early 2000s two of the four Ku Klux Klan members responsible for the bombing. "Words have consequences, especially considering comments you acknowledged you were inappropriate," he said. "I want to make sure you will stand up and do the right thing." The committee was expected to vote on his nomination after Thanksgiving.